Janet Napolitano succeeded Mark Yudof as the 20th UC President after serving as the Secretary of Homeland Security in Washington D.C. under President Barack Obama. UC President Janet Napolitano took the helm of the UC system this fall with a laundry list of big ideas and a loaded resume to back it up. Napolitano, the 20th UC president, came to the position in a series of firsts — she is both the university’s first female president and the first nonacademic to hold the position. But she sees this outsider status as perhaps one of her greatest strengths. Napolitano, a seasoned politician, plans to use her uncommon skill set to “make the case” for the UC system at a crucial point in the university’s history, asking the state government and the public to reinvigorate the university’s public nature after years of disinvestment. Her public push for the university is part of a larger plan to enhance the UC system’s financial viability and accessibility, and it builds off of a career that placed Napolitano both at the head of a state government and federal government cabinet department before she came to the university. Given this experience, the university’s new high-profile leader has wasted no time laying out ambitious policy goals that run the gamut from systemwide environmental efficiency to greater academic support for students — announcements that at times took a backseat to protests opposing Napolitano’s role as UC president in the first place. Four months into her position as the head of the University of California, Napolitano is settling in to her role as the university’s top dog. Napolitano’s position takes her all over the state, but day to day, she works from a high-rise overlooking downtown Oakland. From this perch, she faces the university’s most strident issues: tuition prices, financial efficiency, research funding and more. UC President Janet Napolitano announces a plan to bolster university support for undocumented students on Oct. 30 during a speech hosted by the Commonwealth Club of California at the Mark Hopkins Hotel in San Francisco. Unlike former UC president Mark Yudof and other former presidents, Napolitano does not hail from the administration of some of the nation’s most prominent universities. The political powerhouse spent most of her career in Arizona, where she served as governor from 2003 to 2009, and attorney general and U.S. attorney before that. Napolitano, who is 56, quit her position as U.S. Secretary of Homeland Security under President Barack Obama to come to the University of California — where her base salary is $570,000 a year, a cut from Yudof’s pay. Her appointment led students and others to protest, claiming Napolitano’s former position at DHS made her unfit to be president. Napolitano — pronounced with a hard A — was born in New York City, but she grew up in Pittsburgh and Albuquerque, N.M., where her father was the dean of the University of New Mexico School of Medicine. She graduated from Santa Clara University as the college’s first female valedictorian and went on to graduate from the University of Virginia School of Law in 1983. Ten years later, Napolitano was named a U.S. attorney — a feat her former law professor David Martin called “impressive” for someone so young. Eric Hanson, a professor of political science at Santa Clara who taught Napolitano, said the new UC president has often returned to her alma mater to speak to current students about the relationship between academic achievement and public service — a narrative her own career path has mirrored. Napolitano’s unlikely appointment as the leader of the 10 UC campuses, five medical centers and more than 234,000 students comes at a time of significant change for the university. Proposition 30’s passage in November 2012, which prevented a massive midyear cut to funding, and an improving economic climate has UC officials pushing for “reinvestment” in the university’s academic quality. Napolitano has named creating a stable tuition model as one of her primary goals while in office and emphasized that she is committed to advocating for the university using her political background. At the November UC Board of Regents meeting, she announced plans to freeze student tuition for the 2014-15 school year. Despite her pledge to increase access to the university, some UC students are hesitant to trust the new president. Protests erupted in July when the regents approved Napolitano’s appointment at a summer meeting — and they haven’t stopped since. Protesters consistently greeted her on her tour of the UC system. Despite Napolitano’s many new plans for the university, criticism regarding her involvement overseeing deportations during her time at DHS and lack of academic experience have become the focal point for many observing her tenure at the university thus far. 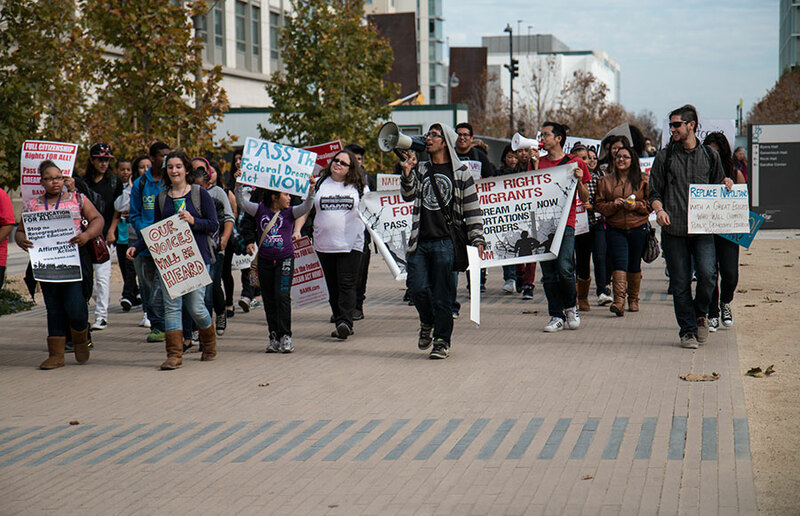 A group of students frustrated by her appointment created the Students of Color Solidarity Coalition, which is in line with the larger “No to Napolitano” movement, organizing protests and campaigning for their cause. Student governments at some UC campuses passed bills expressing dissatisfaction with her appointment last fall. UC Berkeley’s ASUC Senate passed a bill stating it would declare a vote of “no confidence” in the new president if she failed to meet a series of demands by late October, which went into effect in December. ASUC Senator Sean Tan, who penned the bill, said Napolitano has a lot to prove to undocumented students at the university. Although she allocated $5 million to enhance student services for undocumented students as one of her first initiatives, her staunchest critics say money won’t change their opinions. “What do you say to a student whose parents were deported due to the policies of the Department of Homeland Security?” Tan said. Napolitano served as DHS secretary from January 2009 through last September. U.S. Immigration and Customs Enforcement, an agency that operates under DHS, deported nearly 2 million undocumented immigrants between fiscal 2009 and fiscal 2013, according to the agency’s website. Protesters demonstrate outside of the UC Board of Regents meeting at UCSF Mission Bay on Nov. 12, demanding that UC President Janet Napolitano step down from her position. Napolitano said that she understands where student concerns are coming from but that she hopes her actions will help gain some protesters’ trust. She also noted that in her time as secretary, the United States naturalized about 3.5 million people and put some 600,000 individuals through Deferred Action for Childhood Arrivals, a program she implemented that provides children who immigrated to the United States illegally a path to citizenship. Professor Gabriel Chin, a UC Davis law professor who worked at the University of Arizona while Napolitano was governor, said he hardly expects Napolitano to infringe upon undocumented students’ rights. Napolitano said she hopes to continue an open dialogue with those who oppose her appointment. She has also been working to better relations with unions, saying that establishing healthier labor relations is a priority. She cited a number of recently settled labor disputes, including a four-year deal with the California Nurses Association, as evidence of this effort. Still, some labor relations remain tense. American Federation of State, County and Municipal Employees Local 3299, the labor union representing the largest number of UC service workers, led a strike in November that facilitated walkouts and protests systemwide, alleging that the university used intimidation tactics to prevent workers from participating in an earlier strike in May. Napolitano also has her eye on the key constituency she was hired to court: the state. Her highly touted political prowess was put to the test at her first regents meeting, when the university budget requested more money for 2014-15 than Gov. Jerry Brown proposed. Brown’s preliminary state budget for the same time period grants the university a 5 percent increase in funding but does not fulfill the university’s request for an additional $120.9 million. But Napolitano has made clear that she is willing to fight for more dollars. “Part of the discussion I’ll be having with the governor is, ‘Do you look at this as operating costs only, or do you look at it also as an investment?’ ” Napolitano said. Napolitano is familiar with Brown’s predicament. Mariko Silver, a former policy adviser to Napolitano during her governorship, said Napolitano was very focused on financial frugality and keeping Arizona’s public institutions cost-efficient as governor. UC Board of Regents chair Bruce Varner, who served as vice chair on the committee that appointed Napolitano, said this experience on the other side gives her a leg up when negotiating with an at-times unwilling state government. “We think that she understands how to deal with the Legislature and governor and also how to be realistic about what to expect,” Varner said. 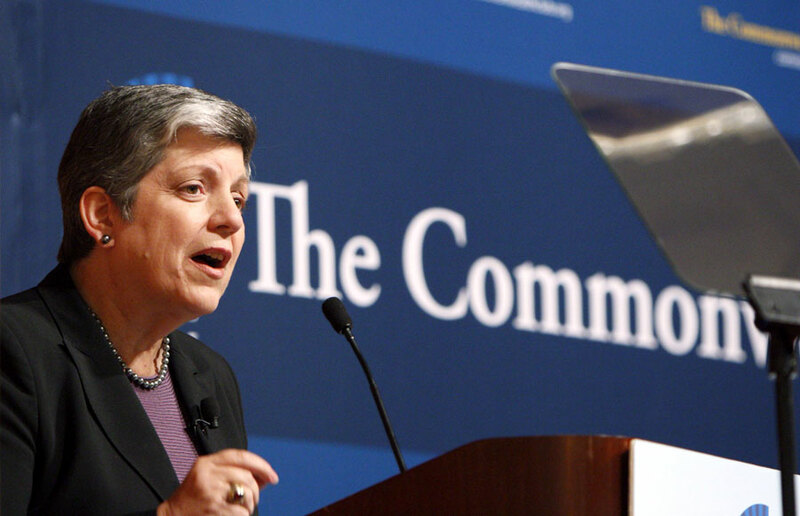 As she prepares for months of bartering with the state, Napolitano is also mapping out her plans for the UC system. The regents are expected to discuss her plan to increase transfer rates from California community colleges in March. By 2020, she plans for the university to cut per capita water use by 20 percent. Five years after that, she wants the UC system to be completely energy-efficient. Paramount in this list of plans is affordability, and Napolitano has said one of her immediate aims is to create a sustainable tuition model that students and their families can depend on. These plans are major and likely the first of many. But the new UC president is approaching her new position and the weighty goals that accompany it with a sense of awe.